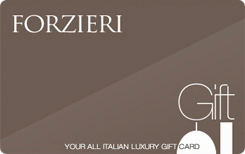 Packaged in our refined gift folder and wrapped with our precious papers and ribbons, a Forzieri Gift Card is available in multiple denominations and may be used for purchase at the Forzieri.com online store worldwide. » You can use only one gift card per order. Gift Cards cannot be combined with other discounts.